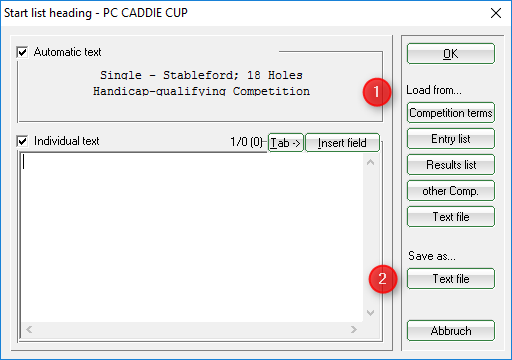 Load the text of the competition terms or entry list. Please change it if you feel like. 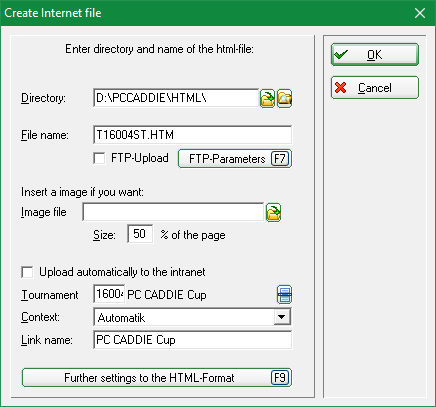 This text can be saved as a text file Save as… text file Please use the path PC CADDIE is suggesting. Select the order and what kind of information should be printed (Main list, Buffer, Waiting list). The gross results of the previous round will be printed. This list shows every flight when the are supposed to be on which tee. By activating this option the right button Def. target times will be also active. You define the holes f.e. hole 3, 9, 12, 15 and the time they need up to this hole. This option makes sense to use in an alphabetical order. The list will show all flightpartners in one line. You will get all the information you need, when a player is asking for his starting time. 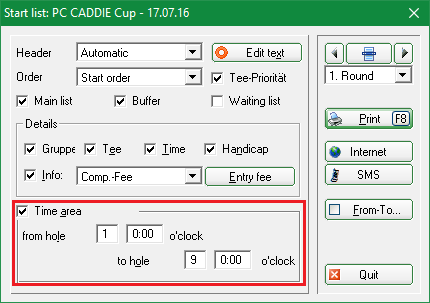 With this option the list will be printed with two teetimes; the current one and the following round. 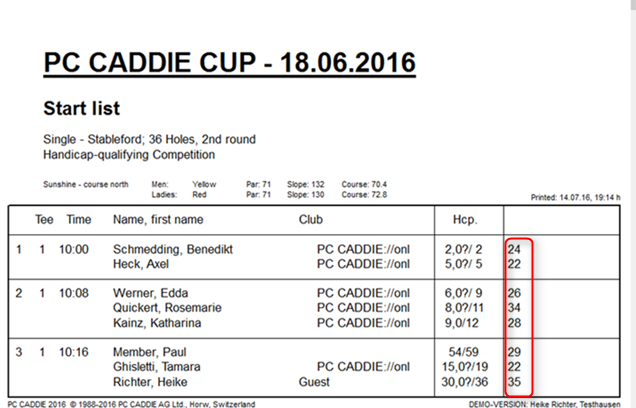 If the flights will be the same in both rounds and just the times are different - this list might help you. The button on the right will be aktive Layout. This option you can use to create your own starting list - like in the persons lists: Persons list . Please be aware, what you selected under Order „Start order“: One is for the list with the time start order and the other one for the other orders. Please check before printing what you selected. The Competition fee will be printed on the list to control. You define the competition fee by clicking on the button Entry fee. Please also read the paragraph Start fee. 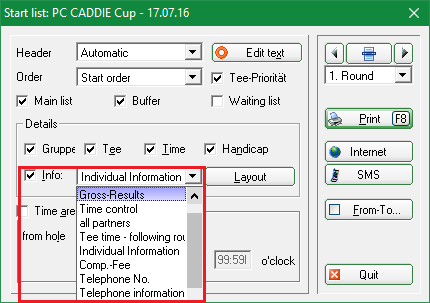 With this option the list will be printed with the telephone numbers of each player. This option is for the additional PCC module Telefon-Informations-System. 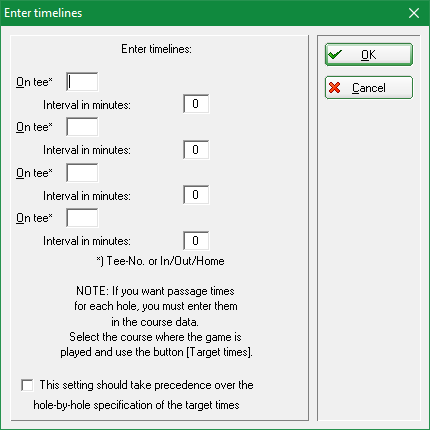 If you activate the Time area, you can select from hole and up to which hole and the time area you would like to have. This list gives you two separate lists f.e. 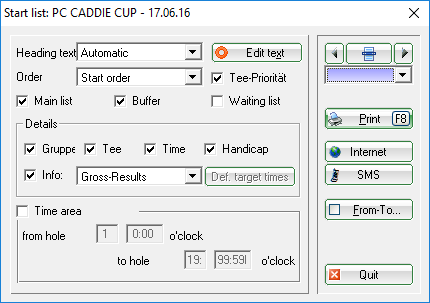 for a start on tee 1 and tee 10 for the morning and the evening. This option you select by using the button Internet. 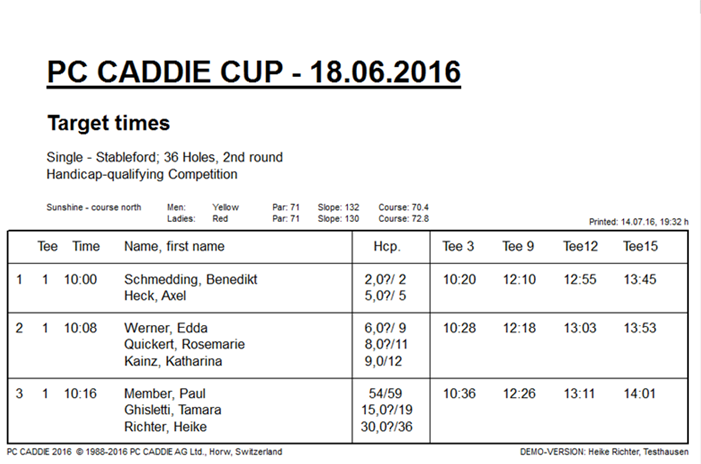 This file can be sent to the DGV-Intranet, PC CADDIE://online Turnier or Swissgolfnetwork. Additional this file can be transmitted to any other server, as long as the correct details are entered. More information you will find under FTP transfer. By clicking on the button SMS you will send an SMS to each player with a mobile number of this competition with the starting time plus the flight partner. If you would like read more about this service Turnier-SMS.